The Feb. 23 holiday to celebrate "defenders of the fatherland," brings cruel reminders to some soldiers' mothers. On Feb. 23, Russian people celebrate Defenders of the Fatherland Day. It is an official public holiday and, supposedly, a happy occasion. 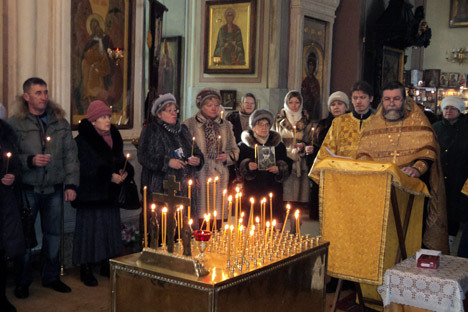 But for the past 20 years, a requiem service for those killed during their military service has been held at the small Church of All Saints in Moscow. It is an unofficial event organised by the Pravo Materi Foundation (Mother’s Right Foundation) for the parents of soldiers killed during their military service – not only in action, but also during peacetime. On this day, dozens of soldiers’ mothers from Moscow and the Moscow Region gather at the Krasnoselskaya metro station and silently go to a church service together, their sons’ portraits in hand. For about 15 minutes, we wait outside for any late-comers. A policeman comes up to us ands asks what the meeting is about, since he has not been informed of any organized event there. People explain that there will be a memorial service. He nods in reply, writes something down in his notebook, and suddenly says: “A guy from my town, Nikolai Karpenko, was killed in Tajikistan. Pray for his soul, too.” Nikolai Karpenko’s name is added to the roll. We enter the church; women wipe their eyes away. For some, more then 10 or even 15 years have passed since their son’s deaths, but it does not matter. The grief over their loss is still real, and it still hurts. The church service begins. I seldom go to church and have to concentrate as I listen to the melodic chanting and try to understand words unaccustomed to my ear, but I clearly understand one phrase repeated over and over: “Lord, may the soldiers who fell for the Fatherland, the people, and the Orthodox faith rest in peace.” Sadly, the requiem service canon is not perfectly suitable for the occasion: Among the young men whose mothers came to the church today, there are many that did not fall on the battlefield for the people and the Fatherland: they were killed in the army during peacetime. They are victims – and there is no canon for them. But for their mothers, crying desolately as they listen to the priest, that does not seem to make any difference. Lidia Borisovna did find her son’s body, but among those buried at the Bogorodskoye Cemetery in Moscow there are many whose parents are still looking for them in vain, trying to obtain an exhumation order. All that remains for them to do is to support each other. They walk out of the church together: those whose sons fell in action and those whose sons were never on the battlefield but were killed in the army. They are united in their grief; they are also united by the state’s indifference to it.